The three synthesis papers I’ve discussed all converged on some observations and conclusions concerning how resilience, really robust resilience, arises from diversity. I had long shared most biologists’ faith that the two were linked. But then, in contrast, I had also become convinced that the structure of ecosystems emerges from the effect of a handful of key processes and their few associated species. They create a self-organized entity. Were these few species not the central species whose function had to be preserved? Were not the rest simply those that existed in response to the basic structure provided by the key processes and species? Was the faith in the value of many species exclusively an, essential, but still purely aesthetic value? Another nice puzzle! But the two values- one of aesthetics and one of structure and function- came together for me from discoveries presented in three additional papers. One was Holling, 1988. That work examined the impacts of the 35 species of insectivorous birds that set the essential 40-50 year boom and bust cycle of the spruce budworm and forest in New Brunswick. I used our budworm/forest simulation model to explore the significance over the full range of potential predation from nothing to maximal. Three distinct cycles appear – one around 15 years in length, one around 50 and one around 100 plus years. The first is set by foliage dynamics, the second by avian predation and the third by tree generation time. But I was surprised to discover that the 40-50 year cycle was maintained over a very large range of predator densities. The 35 species add robustness to that effect, operating consistently until the densities are lowered by more than 70%. Then the system flips into one or other of the other cycles. That is a demonstration of response diversity, something that Brian Walker also showed for plant functional types (Walker et al 1999). In both cases there is a lumpy structure – of mass for the birds and of biophysical measures of function for the plants. That is, plants and animals echo the same structure. That is all brought together in a synthesis by Peterson et al. 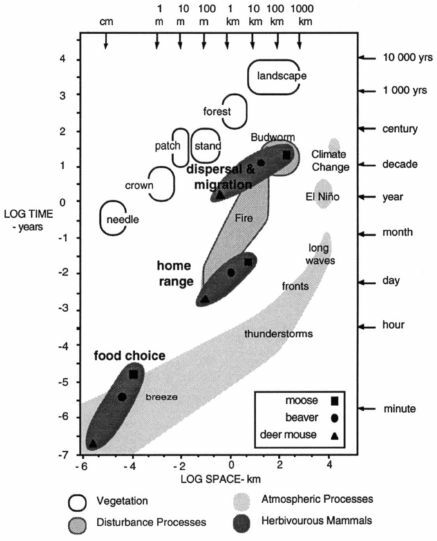 (1998) of alternative models for diversity and ecosystem behavior. That paper exposed, for the first time, the existence of two scales for diversity processes: diversity that affects resilience within a scale and diversity that affects resilience across scales. It is based on the recognition of lumpy attributes of ecosystem properties. In that paper, we show the mechanism by which astonishing robustness occurs across scales because multiple species in a functional group (e.g. avian predators of spruce budworm) can substitute for one another in different climatic conditions and can spread their influence across scales in space because their differences in size are associated with different scales of movement. Hence there are two aspects of response diversity responses- within a scale and between scales. Holling, C.S. 1988. Temperate Forest Insect Outbreaks, Tropical Deforestation and Migratory Birds. Mem. Ent. Soc. Can. 146: 21-32. Peterson, G., C. R. Allen, C. S. Holling. (1998). Ecosystem Resilience, Biodiversity, and Scale. Ecosystems 1: 6-18. Walker, B.H., Kinzig, A., and Langridge, J. 1999. Plant attribute diversity, resilience, and ecosystem function: The nature and significance of dominant and minor species. Ecosystems. 2: 1-20.